Sunglasses are eyewear designed to help protect the eyes from excessive sunlight. Eyes are extremely light sensitive and can be easily damaged by overexposure to radiation in the visible and nonvisible spectra. Bright sunlight can be merely a distracting annoyance, but extended exposure can cause soreness, headaches, or even permanent damage to the lens, retina, and cornea. Short term effects of sun overexposure include a temporary reduction in vision, known as snow blindness or welders' flash. Long-term effects include cataracts and loss of night vision. In both cases, the damage is caused by ultraviolet (UV) light, which literally burns the surface of the cornea. Sunglasses were originally invented to reduce distracting glare and allow more comfortable viewing in bright light. Early sunglasses were simply tinted glass or plastic lenses that were primarily meant to reduce brightness. Darker lenses were considered to be better because they screened out more light. 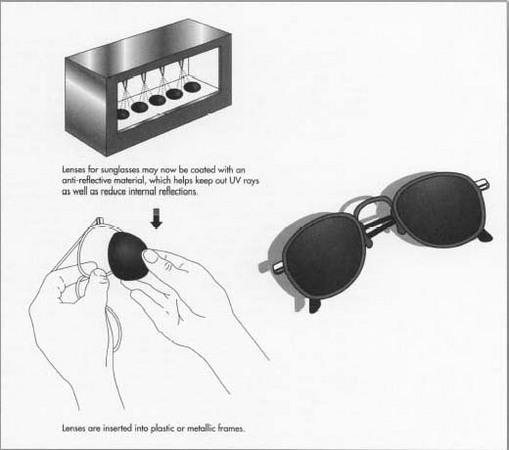 As our understanding of the damaging nature of sunlight evolved, the need for better eye protection was recognized, and technology was developed to help sunglasses better screen out the harmful rays of the sun, especially UV rays. From inexpensive models with plastic lens and frames to costly designer brands with ground glass lenses and custom-made frames, sunglasses are available in a staggering array of styles and prices. Unfortunately there is no way to tell from the color or darkness of the lens how well it will screen out UV light. Similarly, there is little relationship between price of glasses and their ability to block UV light. Sunglasses consist of a pair of light-filtering lenses and a frame to hold them in place. The vast majority of lenses are made of colorized plastic, such as polycarbonate. However, glass is still employed for high quality brands. The highest quality lenses are optically accurate and do not distort shapes and lines. These lenses, like camera lenses, are made from distortion-free ground and polished optical glass. The borosilicate glass used in these lenses is scratch resistant and is made impact resistant by tempering it with various chemical treatments. Soluble organic dyes and metallic oxide pigments are added to the lens material to absorb or reflect light of certain frequencies. These additives must not distort colors excessively, however; for example, badly colored lenses may make it difficult to discern the correct color of traffic lights. Gray lenses produce the least distortion for most people, although amber and brown are good too. Blue and purple tend to distort too much color. The additives also should block at least part of the blue light which is part of the lower frequency UV rays. Brown or amber screen out blue light the best, but at the cost of some color distortion. Various chemical coatings which are added to the lens can enhance viewing by reducing reflection or screening out polarized light. use combinations of nickel, silver, stainless steel, graphite, and nylon in their leading-edge designs. There are two key elements to consider regarding sunglasses design, fashion and function. In the last few decades sunglasses have become a high fashion item, and the current design process reflects this status. Upscale clothing designers, fragrance marketers, and sporting goods vendors custom-design sunglasses to promote their own specific image. By and large these design changes are not functional; they are intended to increase the fashion appeal of the glasses. Stylized frames, uniquely shaped lenses, and embossed logos are all part of this designer mystique. While some designs are considered "classic" and timeless, others must be continually updated to satisfy the public's constantly changing tastes. The children's sunglasses market is another area which requires frequent redesign, since the style of the glasses changes from season to season based on merchandising tie-ins with popular cartoon or other characters. From a functional standpoint, sunglasses are designed specifically for a variety of outdoor activities. Sports enthusiasts have specific requirements that are reflected in sunglass design. For example, sunglasses designed for trap shooters are designed to provide maximum contrast to allow better viewing of their clay pigeon targets. On the other hand, sunglasses for skiers are designed to counter the light reflected of snow-covered surfaces. Lenses of the this types are known as blue blockers, because they filter out violet, blue, and some UV rays. Fisherman and boaters have their own special needs that must be addressed as well. Today there are custom-designed sunglasses for these activities and many more. Sunglasses can protect the eyes in several ways. The glasses can either absorb or reflect certain frequencies of light, for both reduce the amount of light that enters the eyes. The absorbing types use various substances that are added to the lens material to selectively absorb light of specific frequencies. This range of frequencies can be controlled by changing the mixture of colorizing additives. The strength of the absorption is controlled by adjusting the amount of additive. Reflecting lenses have multi-layer antireflective coatings, consisting primarily of metallic particles. These metallic coatings reflect all colors of light and UV radiation equally well. There are reflective types with non-metallic coatings, which create a coloring effect. By varying the type and amount of colorant additive or coating, a large variety of lenses can be produced. The color of the finished lens indicates which portion of the visible spectrum is being transmitted. For example, if the lenses are dark yellowish, they absorb violet, blue, and probably some UV rays. A special type of absorbing lens filters out polarized light. Light actually consists of two waves, one propagated in the horizontal plane and one in the vertical plane. When light bounces off a flat surface, such as snow, roadways, or a shiny metallic objects, the horizontal component is seen as glare. Polarized lenses are made using a special optical filter which absorbs the horizontal component of light and transmits only the vertical component. As a result bright reflected light is eliminated and eye strain is reduced. However, polarized lenses do not block UV light, so they require additional coatings or coloring agents to provide complete eye protection. Another type of lens, the photochromatic lens, contains silver salts like those used in photographic film. These lenses darken out-doors and lighten indoors. In this way the lenses change color in response to UV exposure. However, the range of lenses' color change is not broad enough to be effective against most light frequencies, and although they are widely used, photochromatic lenses are not universally accepted by optometrists. 1 Colorant can be added to lenses in two primary ways, either by adding color to the molten lens material before the lens is formed, or by chemically post-coating the finished lens to achieve the desired hue. In the former method, the colorant additives are incorporated into the lens while the plastic or glass is at high temperatures and still liquefied. Soluble organic dyes or metallic oxide pigments are added to plastic. Metallic oxide or metal particles are incorporated into glass. 2 After the appropriate additives have been blended in, the molten plastic or glass is then cast into the general lens shape, or "puck." Inexpensive lenses are simple pucks that placed into frames. Expensive lenses are prepared in a manner similar to the method by which prescription lenses are made. First the appropriate lens puck is placed in a lensometer, an instrument that is used to find the optical center of the blank. 3 The lens is then put in a curve generator, which grinds out the back of the lens according to the patient's prescription. An edge grinder then grinds the outer rim to its proper shape and puts a bevel on the edge, allowing the lens to fit properly into the frames. 4 Lenses may now be coated with an anti-reflective material. The post-coating method produces lenses that are more evenly coated regardless of the lens configuration. 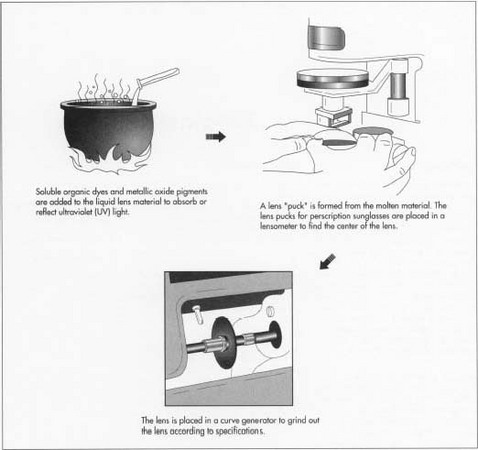 It also allows for the coating to be removed and recoated after the lens is made. Such coating may be applied through a vacuum coating method, used to deposit an antireflective layer on the lens surface to reduce internal reflections. This faint bluish coating is also commonly used on camera lenses and binoculars. 5 The finished lenses are now ready to be mounted in eyeglass frames. Frames are constructed to hold the lenses in place using either a tension mount or screw mount design. Tension mounting is typically used in plastic frames. In this type of frame, the dimensions of the lens opening on the front surface of the frame are somewhat smaller than the lens itself. In this way the lenses can be pressed into their respective openings through the front edge of the frame without falling out its rear edge. A groove is formed in the periphery of each of the openings, and these mate with a ridge formed on the periphery of the respective left and right lenses. The plastic frame material permits sufficient stretching or elongation to allow the lenses to snap into these grooves. 6 Metal frames use a screw mount design because metal tends to deform easily and cannot hold the lenses as well. The metal structure of the frames has thin extruded sections that are bent into desired shapes. The frame structure surrounding the lens openings forms an open loop into which the lens is inserted. After the lens is inserted, the loop is closed by attaching a screw to the two open ends. Beyond the regulations that ensure the glass and plastic used in lenses is shatterproof, there is little governmental regulation of sunglasses. Labeling of the absorbance rates of both types of UV light, UVA and UVB, is voluntary, but the American National Standards Institute (ANSI) has established transmittance guidelines for general purpose and special lenses. According to these standards, general purpose cosmetic lenses must block 70% of UVB, general purpose must block 95% of UVB and most UVA light. Special purpose must block 99% of UVB. To a large extent, the degree of quality control imposed on sunglasses manufacture is a function of the type of sunglasses. Inexpensive plastic models have little concern with optical perfection; they may contain flaws which will distort the wearer's vision. On the other hand, expensive glass lenses strive for high optical quality and are checked accordingly. There are a variety of instrumental methods used to evaluate distortion of the finished lens, but one simple test is to simply hold the glasses at arms' length and look at a straight line in the distance. Slowly move the lenses across the line. If the lens causes the line to sway or bend, the lenses are optically imperfect. For best results, look through the outer edges of the lens as well as the center. There are no particular byproducts resulting from sunglasses manufacture. Waste materials include plastic, glass, and metallic scrap from grinding the lenses and making the frames. Sunglasses manufacturing processes have become increasingly sophisticated in response to greater demand for high quality, stylish glasses. New coatings and colorants which deliver better protection against UV radiation continue to be developed. Improvements in the way frames are manufactured continue to be made. For example, U.S. patent 5,583,199 discloses a new way to make frames from a single piece of metal. New types of high performance sun-protective eyewear will be developed as advances are made in the fields of optics, surface chemistry, metallurgy, and others. Ahrens, Kathleen. Opportunities in Eye Care Careers. VGM Career Horizons, 1991. Gourley, Paul and Gail Gourley. Protect Your Life in the Sun. High Light Publishing, 1993. Zinn, Walter J. and Herbert Soloman. The Complete Guide to Eyecare, Eyeglasses, and Contact Lenses. Frederick Fell Publishers, 1986. Berkeley Wellness Letter 9. The University of California, Berkeley, June 1993, p. 5. It is really good brief discription about sun glasses manufacturing and it indicates the future development in this field.